There’s a lot of sadness in the classic VW community tonight, and especially the Herbie-the Love-Bug-loving subset (which is a pretty large subset), because the man who played Herbie’s racing-driver owner, actor Dean Jones, died today at the age of 84. Jones died of Parkinson’s disease in Los Angeles, and is survived by his wife, three children, eight grandchildren, and three great-grandchildren. Dean Jones performed on stage, screen, and television, but is best known for his roles in a string of Disney movies, where he tended to play affable and slightly overwhelmed everymen in unusual situations. For as many roles as he had, there’s one that defined his career and is most relevant to all of us gearheads, - his role of Jim Douglas, the down-on-his luck and rapidly aging racing driver who discovers a sentient VW Beetle. This is the role I’ll always associate with Dean Jones, and, when you really stop to examine it, it’s a surprisingly good one. Jim Douglas is an interesting and flawed character; we’re introduced to him past his prime, an aging “piston-happy, lead-foot punk” who’s unable to either actually manage to win any races or stop racing at all. He’s a man smitten with cars and driving and speed; a man with gasoline in his veins and an earnest, unashamed love for cars, and in Jones’ hands, it seems to be genuine. Jim Douglas’ first genuinely admirable act is to defend the titular Volkswagen, and the Beetle then becomes a sort of partner/savior/rescuer of Douglas. Hubris takes over, and Jim Douglas proves himself to be as vulnerable and vain as anyone, and is forced to redeem himself. The character is surprisingly and deceptively complex for a kid’s movie, and yet Dean Jones managed to pull it all off with a casual ease and beguiling humility. Not all those who love cars love Beetles, or The Love Bug, and that’s just fine. 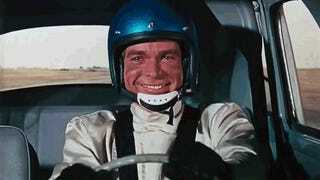 But I think anyone who really appreciates cars has to acknowledge the power the movie had in drawing young minds and hearts over to the gloriously oily side of life, and Dean Jones’ subtly remarkable role in it. So, rest in peace, Mr. Jones.